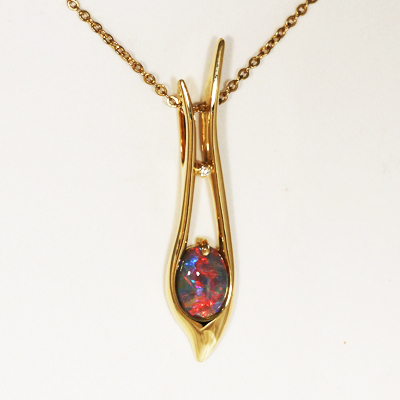 Aussie Treasure Chest Shopping Cart - 18k Yellow Gold Pendant with a SOLID BLACK OPAL Beautiful fiery red blue, Floral Harlequin pattern, top quality. 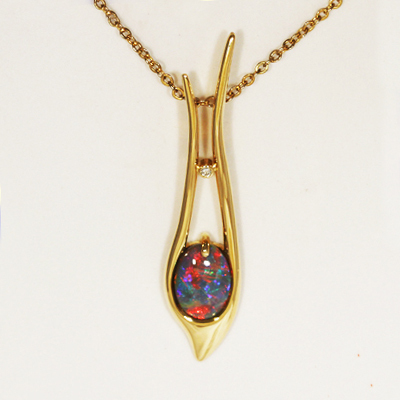 18k Yellow Gold Pendant with a SOLID BLACK OPAL Beautiful fiery red blue, Floral Harlequin pattern, top quality. 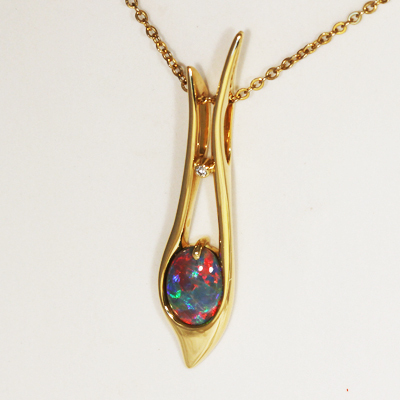 18k gold SOLID SEMI BLACK Opal Pendant. Our Swiss born Jeweller completed a four year Goldsmith apprenticeship in <?xml:namespace prefix = st1 ns = "urn:schemas-microsoft-com:office:smarttags" />Switzerland and graduated with Honours as the top of the class. This top gem quality Floral Harlequin patterned opal is sparkling with very bright and intense colour from all angles. Every colour that sparkle across the face of this opal bright and rich, producing a spectacular show. The strong and bright reds, blues, greens and purple are exploding with full-on fire and moving all over the face as well as deep inside the opal. The colours are so bright that they shine in the lowest of lights. Beautiful colours always showing their full potential. This opal gives a spectacular play-of-colour from all angles and is great in all lights.